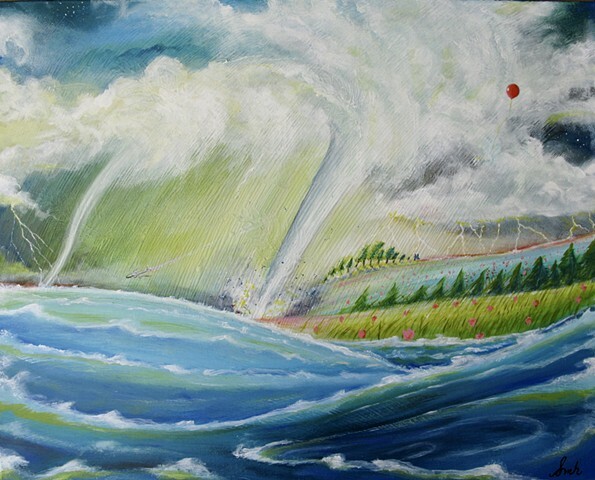 This mix of strange weather patterns came to me in a dream so I did my best to capture all the elements here with the multiple funnel clouds, lightning, and a tidal wave in the making. There is a couple way off in the background holding a flower they picked in the field. Can you see it? And the plane. Well, let's hope they find the black box. This is an original 18 x 24" acrylic painting on canvas. You can frame to your liking but the edges are painted a dark blue-green so no frame is necessary. It is varnished, wired, and ready to hang. Please understand that computer monitors vary and, while I have done my best to capture the true colors they may look different on your screen than they do on mine. My work is usually spontaneous, and while my collages may seem simple, I tend to labor over each one for hours. ADD makes it very hard for me to organize, so finding just the right combination of colors and shapes is a challenge. Every piece I assemble is both a labor of love and an obstacle to cross. They are like putting together jigsaw puzzles, except I haven't seen the image beforehand.